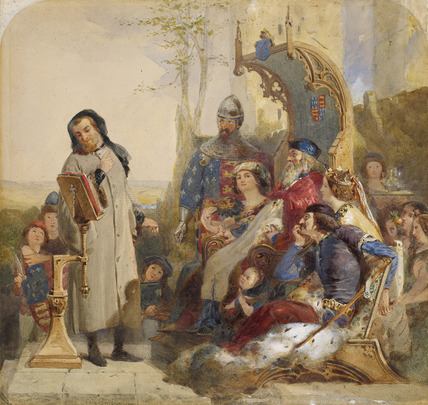 Chaucer stands on the left reading from a lecturn. Three page boys stand behind him, one on the left holding a shield and one on the right a book. Standing on the right in armour is John of Gaunt. Sitting below him are: Alice Perrers, fanning herself, Edward III, sitting in his throne, Joanna, the Fair Maid of Kent and her husband Edward, The Black Prince. Just in front of Joanna and the Black Prince sits a toddler. On the far right behind the throne are two ladies in waiting, one smelling an orange, and a male servant carrying a tray with water and glasses. Watercolour with bodycolour on paper.